I’ve been a bit neglectful of late, but I’ve had this in draft for a while so it’s time to get it out there! I don’t know where my Mom got this from, but looking at this post I realise that I should probably have called it something more apetising like ‘Oat Bread’ or something, but she always calls it Porridge Brown Bread because… well that’s what it’s made from. Are oats called porridge before you make them into porridge though? Don’t answer that. 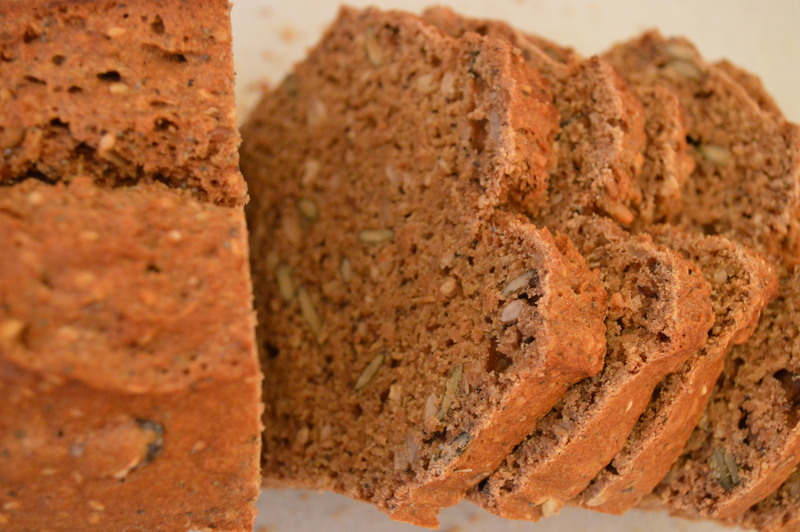 This is really very tasty, it’s more filling than regular Brown Bread, and it also keeps better for longer. Sieve in Bicarb of Soda and salt, then stir in the Oil and finally mix in yoghurt, stir it in well. Prepare tin and drop mixture into the tin shake tin to settle the mixture. You can top with Seeds and also add some to the mixture if you like. Bake at 180 degrees for 50 -60 minutes. Like most breads, the timing is hard to get right, and will depend on your oven, but longer is better, it is very moist, and while the outside might look well done sometimes the inside is still wet, so check with a knife/skewer. Leave to cool on a wire tray. One of the many things I tried to help with my excema was to cut out (or down on!) wheat. Mary B made it first and then gave me the recipe which is originally from the Cornucopia recipe book…which I have since bought! It’s a vegetarian restaurant in Dublin (I’ve never been) and Gaye Godkin recommended their book for lots of recipes using pulses and veg etc, I haven’t made much from it so I must experiment with a few more recipes! I’ve made this bread a few times however, I’m not an expert on bread but I have realised that every oven is different so it generally takes a few tries before you know the best temperature/time for your oven and bread. I need to bake this for 5-10 more minutes than the recipe says so I leave it in for over an hour and the most recent batch seems to have worked out well! I cut half of it into slices and have put them in the freezer so I’ll let you know how well that works! It’s very tasty, the molasses give it a good flavour, though I couldn’t find the blackstrap version here in Belgium – if you can even better. It’s also very filling! * If you don’t have all 5 different seeds, you can use whatever seeds you have – just make up a total of 150g of mixed seeds. Preheat the oven to 180C and brish the bread tin with oil, or line with baking parchment. Sift the flour and baking powder into a large mixing bowl. Add the salt and all the seeds and combine thoroughly. In a jug, combine the water and treacle, stir well and then pour it into the well in the centre of your dry mix. Use a spoon or your hand to bring all the ingredients together evenly. Make sure that the treacle is evenly distributed, not clumped in sticky pockets. Use as little mixing as possible to achieve an even mix. It should be of a very sloppy consistency. Transfer the mix to the oiled tin and pres down evenly – I also run a knife down the centre of the mix. Bake in the centre of the oven for about 60 minutes, until well risen and evenly browned. Run a knife around the edge of the loaf, turn out onto a wire rack and tap the base with your finger. If it makes a hollow sound, the bread is cooked. Cover with a tea towel and leave to cool completely on the rack before cutting.